Arada is one of the 10 subcities of Addis Ababa, the capital of Ethiopia. As of 2011 its population was of 225,999. The district is located in the northern area of the city, nearby the centre. 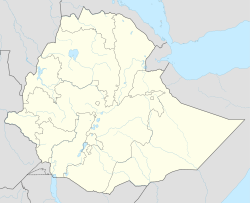 It borders with the districts of Gullele, Yeka, Kirkos, Lideta and Addis Ketema. Arada is known as the center of the old and the new generation artistic, social and urban life style. Its main sights include St. George's Cathedral, the great Menelik II Square, the Hager Fikir Theatre, the Taitu Hotel, Charles de Gaulle Square and many other historical areas and structures. Istituto Statale Italiano Omnicomprensivo di Addis Abeba, an international school operated by the Italian government, is in Arada. ^ a b c d "Arada Archived January 11, 2013, at the Wayback Machine". City Government of Addis Ababa. ^ "Dove siamo" (Archive). Istituto Statale Italiano Omnicomprensivo di Addis Abeba. Retrieved on October 19, 2015. Google. "Arada" (Map). Google Maps. Google.